The government has positioned halving the disability employment gap as a central challenge for the UK labour market. To make significant progress on this ambition, a comprehensive set of changes will be needed, alongside a cultural shift in how we view the connections between disability, health and employment in this country. The Green Paper on this topic due to be published later this year provides the perfect opportunity for reflection, and the purpose of this report is to offer a new set of ideas that can be considered and developed in it. In particular, we see an opportunity for a renewed focus on one area of policy where we think attention has often been lacking: the employment relationship and exits from work connected to disability and ill-health. 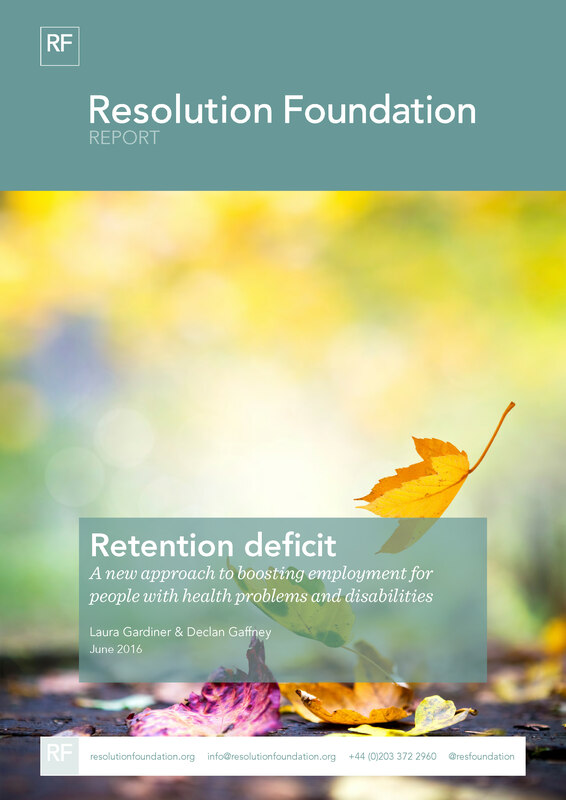 The main contention of this report is that while there are things to be celebrated and continued, the policy focus around employment for people with health problems and disabilities has been too narrow, in three respects. First, it is too benefits-focused, both in terms of the motivation and the preferred method of delivery. Many workless disabled people are not in receipt of benefits, and benefit off-flows do not always equate to sustained employment. Our second criticism of the policy agenda is that it’s insufficiently focused on supporting people in work. Stemming from the getting-people-off-benefits rhetoric, the tendency has been to focus on supporting people with health problems or a disability to enter employment. There has been less recognition that supporting people to remain in work can play at least as much of a role in overall outcomes. Building on this employment retention focus, our final criticism of the current policy agenda is that it is too late to engage. A typical trajectory from employment, to sickness absence to worklessness and benefit receipt involves six months in receipt of Statutory Sick Pay, followed by at least three months waiting to be assessed for Employment and Support Allowance and then directed towards back-to-work services. This is a problem because, as is well known, time away from work is a key determinant of the chances of re-entering employment. The expansion of the successful Access to Work Programme to maximise its role in supporting people to remain in work, including greater publicity and accessibility for employers. The introduction of a ‘right to return’ period of one year from the start of sickness absence during which employers must keep jobs open, learning from the success of maternity policy in this country. A rebate on Statutory Sick Pay costs for firms who support their employees to make a successful return to work from long-term sickness absence. Early referral to the Work and Health Programme for those in receipt of Statutory Sick Pay for whom changing jobs is likely to represent the best chance of a successful return to work.